Earning a high income doesn't automatically translate into high net worth. In some cases, high earners simply spend more and end up with fewer assets than moderate earners who are also great savers and investors. This situation can result from status seeking and inability to delay gratification or below-average understanding of personal finance. In his book, The White Coat Investor (and his website of the same name), James M. Dahle, MD, remedies this problem. He educates physicians (who are generally high earners) on personal finance and investing so they can enjoy the fruits of their valuable knowledge and life-saving labor. Earlier this year, I attended a financial media conference, where I heard Dahle speak about his effectiveness in “Helping Those Who Wear the White Coat Get a ‘Fair Shake' on Wall Street.” At this session, Dahle gave away free copies of The White Coat Investor: A Doctor's Guide to Personal Finance and Investing. Thanks to this gift, I had the chance to learn a couple of new things and reaffirm many of my beliefs about personal finance. This book is an easy and concise read. Dahle does an excellent job of 1) breaking down financial concepts in easy-to-understand language and 2) providing easy-to-implement advice. What I love about the book is that — unlike some personal-finance resources — the author doesn't oversimplify complex ideas in a way that distorts meaning. Instead, he explains ideas succinctly yet precisely. This book is written for physicians by a physician. It's ideal for a resident or even medical-school candidates deciding where to attend medical school (hint: choose the most inexpensive school that accepts you). Others who will benefit from reading The White Coat Investor are family members of physicians and folks in high-earning professions. A recurring theme is the idea that those who generate high incomes should focus on their careers while taking basic steps to establish and protect their financial futures. Dahle covers a lot of ground in his book from situating yourself financially in the first year out of residency through retirement as a millionaire or multi-millionaire. He discusses building wealth as well as enjoying life and doing meaningful work, whether it's practicing medicine or pursuing another career after you've reached financial milestones. Generally, the more money you have, the more choices you have. Dahle shows you how to expand your options and get wherever you want to go in a common-sense style. He dispenses conventional wisdom like “live like a resident” after finishing residency (for non-medical professionals, similar advice could be “live like you're still in college” in those first few years after graduation). He also delves into what living like a resident might look like and its long-term benefits. For example, the book contains profiles of wealthy physicians and how they achieved this status through frugality, high savings rates, and aggressive debt payoff. Going further, Dahle presents pros and cons (and his well-thought-out opinions) on opportunities, challenges, and financial products often presented to physicians and high earners. Some are unique to physicians, such as physician mortgage loans and specialty-specific disability insurance; some are more relevant to physicians than other professions, such as opportunities to invest in medical real estate (such as surgical centers) and methods of paying off six figures' worth of student loan debt; and some could be applicable to high earners in non-financial disciplines, such as ways to vet financial advisors and reasons to invest simply in low-cost index funds. As I mentioned earlier, Dahle does a great job at making complex ideas understandable and connecting dots in fresh ways. For example, one thing that he cleared up for me was the use of Health Savings Accounts (HSAs) in retirement. I had heard that you could withdraw money from your HSA in retirement tax-free in amounts equivalent to past medical receipts (in addition to paying for current medical expenses). What I didn't get was why you'd want to do that. The prospect of saving receipts from my 50s so I could withdraw money from my HSA tax-free in my 80s seemed like a lot of trouble and full of documentation nightmares. It seemed like I would want to use HSA funds to pay bills when they came due, not with years or decades separating bills from withdrawals. Dahle explains that this method is simply a potential tax break (he calls this tax-free withdrawal a “loophole”) that a high earner could pursue to keep taxes down in retirement. This approach isn't necessarily the best one or ideal for every HSA saver but simply an option that could suit some readers. The White Coat Investor contains excellent content on personal finance and smart evaluations of major choices that physicians will likely need to make. Physicians and aspiring physicians will benefit greatly from reading this book to learn how to build and preserve wealth. 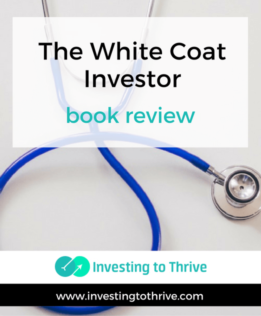 Have you read The White Coat Investor? How did this book help you?